The source of the Mayes Brook isn't especially obvious, nor indeed certain, in the midst of the built-up area of Chadwell Heath. But local contours suggest a pronounced thin dip to the north of St Chad's Park, so my money's on the turning circle of bungalows at the end of Chadville Gardens. The adjacent park is the last surviving remnant of former heathland, with an ornamental sector (gardens/blossom/dogs), a recreational sector (basketball/grass/dogs) and a wildlife conservation sector (well-trimmed undergrowth/dogs). The lie of the land suggests the fledgling brook flowed along the edge of the latter, indeed there's a broken line of lime trees that could very easily have grown up, long ago, along either bank. The boundary between Redbridge and Barking and Dagenham runs precisely here too, which is often a sign of a former river long gone, or at least hidden away in a drain. It's a pretty, if inauspicious, start. Tracking the next half mile requires walking the streets, specifically Jarrow Road, a speedbump avenue of hedges and hardstanding. On reaching Chadwell Heath Lane there's a dip in the road between the pharmacy and the off licence that's so obvious it could be a textbook example of lost river evidence. But that's the last obvious contour you'll see. From hereon down the river valley is essentially flat, or as near as makes no odds, with just ten metres to descend over the next four miles. A tiny tributary feeds in at the end of Roxy Avenue, this apparently open water but corralled within the confines of an academy and so invisible to non Chadwellites. The main river would have crossed the High Road in the vicinity of a Met Police Traffic Operational Command Unit, rammed with boxy white vehicles, and a Harvester 'Salad and Grill' restaurant. And then it's onwards piped beneath the Norwich-bound railway, spanned by a lengthy green footbridge with views into the rear of a retail park. I do hope I'm not overselling this. Mayfield School is reconstructing itself into a series of white and green cuboids, one of which is the new Sports hall, another a new classroom block. One of the fresh landscaping features outside is a gabioned trench, which might just be a nod to the Mayes Brook, just as the name of the school most definitely is. The footpath emerges at Brooks' Parade, its apostrophe carved deep into the stone plaque above the accountants, and again located precisely on the boundary between the two boroughs. And now at last we get to see some water. An extensive ornamental lake at the northern end of Goodmayes Park is aligned with the former Mayes Brook, now home to wide range of waterfowl including a squadron of divebombing geese. Redbridge council have barriered off several shallow sets of steps leading down to the waterside, presumably in case some bread-chucking toddler should topple into some potentially toxic algae, which does rather diminish the overall appeal. The remainder of Goodmayes Park is more sports-oriented, with organised under-5s football and free tennis for all (although a sequence of abandoned, cracked-up tennis courts clearly reveals where the money ran out). There's even an extension to the park across Mayesbrook Road, which is essentially a mown polygon large enough to cram in a dozen football pitches, although at present there's only one. Two vandal-proof pavilions await high season custom, though today more likely the hideaway of a single skulking weed-smoker. And that'll do for Redbridge, the remainder of the course being heartland Barking and Dagenham, which might just explain the huge UKIP poster that wheeled past on the back of a truck when I reached Longbridge Road. Beyond the municipal gates, Mayesbrook Park is rather splendid. You'd expect as much from a park that's had three quarters of a million pounds pumped into it by the Mayor and the Thames Rivers Restoration Trust, its centrepiece an entire mile of reconstituted river. A mile of concrete channel has been landscaped down the western side of the park, sealed off from prying feet at the top end to create a secluded wildlife reserve. Along the next open section I watched a heron having an aerial battle with a crow, presumably over who had the right to roost in the clear glassy shallows. The crow eventually won, settling in by the discarded burger box, forcing the heron to flap its enormous wings and swoop upstream to lesser pickings. Beyond the sports centre the relandscaping is even more extreme, with gentle meanders snaking across modified wetlands, the plan being to increase residential protection by extending the flood plain, but to do it in an attractive way. It works, on both levels. Don't look too hard at what happens next, as the original steep-banked concrete channel returns. Instead be distracted by the two vast boating lakes, these of older extraction, on which the Barking and Dagenham Canoe Club exercises every Wednesday evening and Saturday lunchtime. These lap up almost to the District line, beneath which the Mayes Brook dips but no walker can follow. Instead a dull diversion by road is required, passing Upney station and emerging by the Rippleside Burial Ground. Ahead lies the Mayes Brook's second most accessible stretch, this a long broad artificial channel beyond a sluice down the side of an industrial park. It's not beautiful, and it's not a public right of way so doesn't lead anywhere, but it's still a darned sight better to see the river above ground than below. 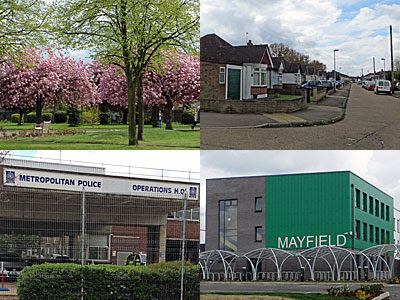 A metal fence just before the A13 forces the longest diversion of all, through the interwar estates of Barking south. As a bonus this means passing Eastbury Manor House, a Tudor homestead that must have been located here thanks to lush meadows and ready access to running water, and is now a National Trust property with a sideline in stretch limo weddings. Crossing the A13 involves negotiating the Charlton Crescent Subway, part of Barking and Dagenham's millennial Artsline project, strikingly illuminated by a sequence of colourful LED lighting bands. If you only visit two sentences in today's report, make it the last two. By the subway's southern entrance the Mayes Brook is briefly fully revealed, before vanishing behind a long screen of wooden panels protecting residents of Barking Thames View from the din of the Barking Bypass. And that's almost the lot, bar a low sweep around a business park and a tidal sluice propped up by parallel concrete struts. 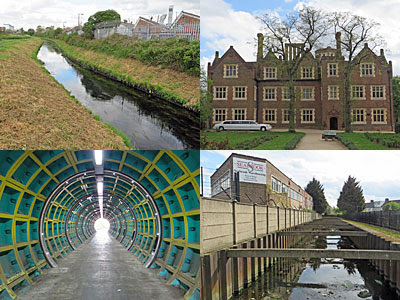 The Mayes Brook then enters the Roding unseen, enveloped by trading estates and industrial hinterland, immediately opposite the Beckton Sewage Works. 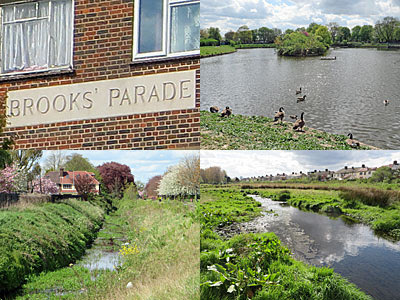 It's an ignominious end for a river that struggles for an identity, briefly flourishing in Mayesbrook Park, but essentially unlost and unloved.